We had two experts from Avira presenting on mobile malware this week. Close to 80 students and staff attended a FirmenForum presentation given by Alexander Vukcevic, Director Virus Labs, and Marcus König, Manager Advanced Research and Technologies. Smartphone operating systems are attractive targets for cyber criminals. 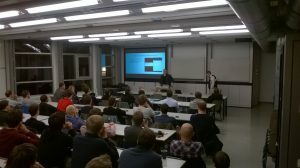 Not all mobile operating systems are equal, and the presentation discussed differences in the protection models of iOS, Android, and Windows Phone. Attack scenarios and approaches of mobile malware in the field were discussed.